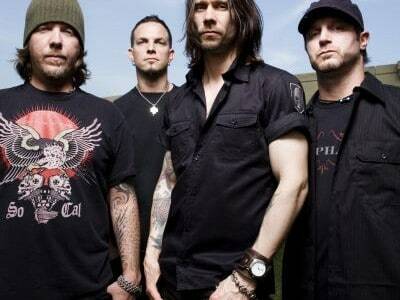 Alter Bridge have always been able to evoke a range of emotions live and on record with their super-charged mix of alternative rock influences. Now, they are in the middle of a 2010 tour in support of their third album, ‘AB III‘ and we catch up with drummer Scott Phillips in Newcastle to talk about the new album, the band’s attitude to touring and…er, zombies. S] Firstly, how do you think this album compares to the previous two? SP] I think for us it’s just a natural evolution from where we finished the last record to now. I think it’s a little more progressive; It’s still in the same vein as our ‘Blackbird’ album, but a continuation of that. S] It’s been noted that there’s an unusually dark element to this album that’s different to the previous ones – what kind of themes and ideas are present within that? SP] I think the overall theme is maybe about a person who has always believed in an absolute truth, and then coming to find out that that absolute truth isn’t actually true – be it a relationship, spiritually, whatever may come into your life. I think that’s the general theme of our three albums and songs. S] How do you feel the album has been perceived by fans – did you feel nervous given the change of mood as to how it would be received? SP] I’m sure there are some people out there that are scratching their heads as to why we took this direction, but it’s been received overall extremely well. To answer the second part of the question, I don’t know if we were nervous, but sort of anxious. For a lot of the two previous records, there were some uplifting songs on there, even though topically maybe it was about struggle and persevering through that struggle. But this album is definitely darker. I guess we were somewhat nervous about releasing it to the fans and hoping that their reaction would be positive, and so far it has been. S] What song means the most to you from this record? SP] ‘Wonderful Life’ is a song that I think means a lot to all of us weirdly – you know, it’s sort of about dealing with the loss of a significant other. We’re all married, and we all have to go through that at some point. ‘Words Darker Than Their Wings’ is a song that I really, really like. It’s a very dark song lyrically, but it just sort of strikes a chord with me. S] It has been said countless times that this record is ‘dynamic’ – can you tell us which songs represent that idea the most for you? SP] Let’s see – songs like ‘All Hope Is Gone’ where there’s your verse and your chorus, not quite as moody as the bridge might be. I think the common theme through a lot of this record is the bridge section, or the B section I think as they call it, which is probably song for song the darkest piece of the whole record. Songs like ‘Wonderful Life’, which are sort of sad and melancholy and sort of intimate through the verses and the choruses, the bridge and the outro are very much darker, sort of bringing the sadness to the forefront. S] ‘Slip To The Void’ is a dark, almost ballad-esque tune – what life-experiences inspired that song? SP] I think it’s a song basically about slipping to the dark side – not to use a Star Wars quote, but it’s certainly about journeying to a place that’s not very friendly. S] What’s the best thing about being a member of the band for you? SP] Definitely not being around our bass player [looks at Brian Marshall]. I’m kidding! I think for all of us it’s just something that we absolutely love to do, and more importantly we love doing it with the people that we are. For Mark, Brian and myself, we’ve now known each other for 15, 16 years [with Creed] and have shared a lot together, and the fact that we can still sit in this small room together and not be at each other’s throats I think speaks a lot for all of us. I’ve known Myles [Kennedy, vocals] now for a little over a decade but didn’t get the chance to really become friends with him until the beginning of 2004. He’s such a sweetheart, an immense talent. We all share a lot of the same character traits, the same personality. So I think doing it with the people that we’re doing it with and creating the music that we create is why this is so special for us. S] If you hadn’t become a musician, what else do you think you might have gone on to do? SP] I have no clue. I probably would have worked at, or hopefully at some point owned, some type of a hi-fi store – a stereo, TV, home theatre and car stereo system type place. That’s sort of what my passion was as a youth. So hopefully I would have been doing that, or I probably would have been selling vacuum cleaners. S] You have a great deal of live energy – can you talk to us about what performing live is like in contrast to being in the studio? SP] Live is definitely a different animal than the studio. The studio’s where you get your chance for song-writing and the actual playing, and your creative juices I think are flowing more. The live setting is certainly where you get to unleash all the energy that might have been pent up while you were in the studio creating the work. We’ve been so fortunate in our travels, especially here in the UK and in Europe in general – the crowds are just phenomenal. They’re full of energy, and the more they give to us, the more we certainly want to give back to them. S] How are you enjoying touring the UK? SP] Loving it. I want to say this is probably our seventh or eighth or ninth trip over here over the years, and we keep coming back for a reason. We certainly love the atmosphere here, and the fans and the people, and everybody’s very personable and very energetic. We’ve been very blessed to have the warm acceptance that we’ve had with the fans in the UK. S] How important is it for the band to cover every area of the UK, and smaller cities like Newcastle, rather than just focusing on places like London? SP] It’s extremely important for us. That was something that we set out to do from day one, from starting Alter Bridge – we definitely wanted to come to Europe and the UK, and wanted to explore as many territories as we possibly could. London is certainly a big city, and we have always been lucky to draw a big crowd there, but it’s not just about London; it’s about the entire country. It’s not like everybody can hop on a train and get to London quickly. It’s extremely important that we explore all the areas that we possibly can. S] As a band that inspires many people with uplifting melodies and generally positive lyrics, what keeps you inspired on a day-to-day basis? SP] I think our love of doing this is what inspires us to do it – the fact that, as I said earlier, we love doing this and love doing it with the people we’re doing it with. We want to continue that as much as we can. That’s certainly inspiring to us; it makes us want to continue to come back and perform as much as possible. S] It was said that for this album there wasn’t a lot of time for you to get organised from the beginning as a band and that it was very ‘spontaneous’ – what was the biggest challenge for you? SP] I think the biggest challenge was probably just the timeline that we had. When we wrote and recorded the ‘Blackbird’ record, we did it over the course of a year and a half almost. We took off most of 2006 while transitioning from one label to another, and had months and months and months to write ‘Blackbird’. From when we started writing it to where we finished twelve months later, there was a drastic change in where the songs ended up. They started off as one idea and over the months, the more you play them the more you find these little nuances and inflections that you can add to it that make the song different. Working on this record, we had two months basically. We had to arrange it – these ideas that I think Mark had for a while and Myles had for a while. But the collaboration of the four of us sitting in a room and actually taking the parts that we were going to work on and then turning those into actual songs, we only had I guess about eight weeks to accomplish that. You didn’t have the extra months and months to let these songs sort of breathe and develop and turn into new entities, so I think we all went in with a very open mind and said in the studios, ‘Whatever happens, happens. If you can think of something you want to add, let’s just do it and keep going.’ I think that really does show up on the record, and it kind of proved a good point to us that you don’t have to sit in a rehearsal space for a year to write a great record. You can do it off the cuff, and whatever comes, comes. S] What’s next for you guys after this mammoth euro tour – will you be taking a break? SP] We’ll get a small break. We finish this tour on December 4 in Italy. We’ll go home and perform a handful of dates before the holidays and a handful of dates after the holidays. From there, I think early to mid-January, Myles has still got some commitments with Slash, and hopefully we can all go out and watch the show; we’re very excited for him that he’s having the opportunity to do this. We’ll probably take some time off between mid-Jan and the beginning of March, and then from there we’ll start a US tour for Alter Bridge. Then currently the plan is to definitely come back over here for the summer festivals as well as some of our own shows. Then just sort of see what happens really. S] Next, a Halloween-inspired random question – In the event of a zombie outbreak, what weapon would you use to defend yourself and why? SP] Actually we’re going to be in Sweden for Halloween and I’m assuming that I probably can’t use a gun there – and a shotgun would probably be best for zombies, at least in the movies I’ve seen, that tends to work. So I’d have to go with a flame thrower. At least you can keep a good distance away from the zombies. You don’t have to get so close to them; you can burn them off. S] It sounds like you’ve got it quite well planned! SP] I’ve thought about it a lot! S] Finally, do you have a message for the readers of Soundsphere? SP] Thanks for the opportunity to let me be a part of the magazine for this month. I’m certainly excited to come back to Europe very soon and continue our tours.